"White Wind" ("Belyj Veter") company, well known in Russia notebooks vendor officially announces today first Russian Pocket PC device. The device is called Rover PC P6. The company tells that this device will be the first in a product line of Russian Pocket PC powered products planed for release in nearest future. The screen: 3,8", Reflective TFT, 65 536 colors, 240 x 320 pixels. If you are experienced Pocket PC user, you have to recognize this device as a new modification, new life of old well known Pocket PC hardware called @migo. This is absolute true. The Russian Pocket PC is made in Taiwan by the factory that manufactured @migo. Rover PC has the same angular, bulky case like @migo does. The device has absolutely the same simple unpretentious design, the same PCMCIA (PC Card) slot, etc... It's absolutely the same in all aspects like old @migo except one small, but very important detail. The main new feature of Rover PC P6 is it's operating system. The Russian Pocket PC has standard Pocket PC 2002 device with 206 Mhz processor, 64 Mb of RAM, 32 MB ROM (Though you will not be able to copy your contacts or calendar into Rover PC like you would do it with iPaq). Rover PC has reflective TFT screen with 65,000 colors. The brightness is tuned not by button, but by small operating wheel that looks like Sony CLIE JogDial. It's a little bit unusual... The illumination detector is not built in and brightness is tuned manually. The screen looks like iPAQ's in terms of size, but it is no as bright, comparing both to iPAQ and Jornada 568. The screen is not convenient for books reading, but if you like games, it's absolutely ok... :-) The main battery keeps power during 4 house of continuous using MP3 functions providing minimum brightness level. One more thing we would like to mention... We installed JS iPAQClk and it works! I was capable overclock processor speed with JS iPAQclk utility! I think that the device should work continuously for 6 to 8 hours being used in standard operation mode. The cradle can be connected to PC both to USB and to COM port (with optional cable). The main interesting thing is that the device has Russian Pocket PC OS installed into ROM. In general Microsoft doesn't provide ROM versions of Pocket PC 2002 for Russian as well as for other languages like Arabic, Polish, Hungarian, Czech, Greek, etc. There is also no even basic national languages support in Pocket PC and Pocket PC 2002. You can't input text in these languages, you can only read texts in Russian and other languages as appropriate languages fonts are inside the system. Nevertheless there are software localization solutions on the market that solve the problem. Installing special application into RAM of your Pocket PC device, for example, Language Extender by Paragon Software (SHDD), you can enable all necessary features of your native language support (on-screen keyboard, regional settings, synchronization support) and even more... you have an optional feature of software translation of the whole OS interface to your national language (the interface translation is optional and can be disabled/enabled at any time). For the moment Language Extender is a de-facto standard solution used by a number of Pocket PC/Pocket PC 2002 devices manufacturers and their official distributors in many European countries, including Russia, where LE is distributed with all Jornadas, iPAQs, and most of Casio Cassiopeia and Siemens devices; NEC, Toshiba and Pocket LOOX seem to go the same way. In addition to Language Extender software localization package provided by Paragon also includes PenReader that is unique solution for natural full screen handwriting recognition that support almost all European languages. It something like MS Trascriber, but not only for English speaking customers. But "White Wind" company didn't go standard way and didn't use standard solutions. Instead "White Wind" ordered Russian ROM localization from Quarta Technologies. From first point of view Russian ROM seems to be more reasonable solution than using software localization. But if we try to investigate the problem in more details, we'll find that ROM localization provided not by Microsoft, but by third party solution provider can result to many principle problems. What are advantages of ROM localization? If you are not Russian or Polish or Czech guy, you can't understand this feeling when opening a box and pushing On button you see the device interface in your native language. ROM localization can't be lost by sudden hard reset like it could happen with software solution. Customer doesn't need to install national software localization after each hard reset of his device. These advantages are obvious and clear. The question is: why do former Compaq, HP, Siemens, NEC, Toshiba, Fujitsu-Siemens, Casio still choose software localization doing business in regions like Russia, East Europe, Scandinavia? Only two weeks ago it was announced on special press-conference organized by new HP company in Moscow that new company prolong the agreement with Paragon for Russia. We think they know about Rover PC and about new technology of ROM localization. There are several reasons of this decision. ROM localization is not developed well enough to go successfully software localization market. There are still many technical problems. As an example, we can tell about problems of third party applications installed on Russian Rover PC we faced. While installing WizBar program, the device crashed and the result was complete hard reset. It's not good behavior, isn't it? We faced some problem with JS Landscape, many games don't work on Rover PC. PocketDivX is compatible with this device. There are no such problems with software localization. And finally... The marketing researches made by different independent market reviewers tell that only 30-60% of customers in Russia and East European countries need interface translation (the exact % depends on country). All others prefer to have only basic native language support realized in original English interface. So in the case of Rover PC or any other ROM localization there is no choice for end customers who prefer an English interface. At the same time the Language Extender has an option that enables each customer to switch on/off interface translation according to his personal needs. 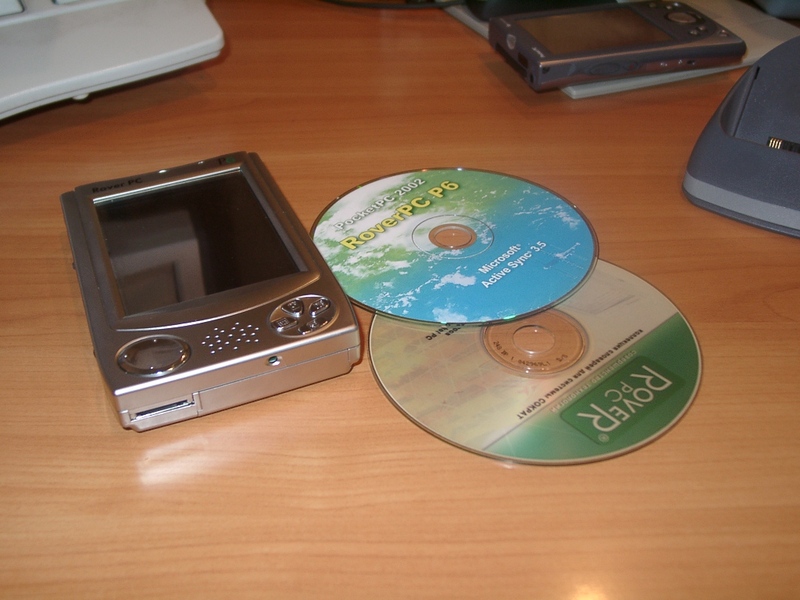 The device ROM is also includes English-Russian dictionary, one of the most useful utility for customers who own palmtop computer. And we see again a kind of game against Paragon Software (SHDD) that is also well known on Russian and international markets as a qualified developer of popular software dictionary product line - SlovoEd (Reviewed on Microsoft's Website). And here again "White Wind" goes not standard way. They include into the package another solution by another solution provider though they deliver this solution not installed into ROM, but on a CD-ROM with additional software. By the way, this is big news for Russians. In any case Rover PC will be very interesting example which success or failure will show very interesting tendency of way that Pocket PC goes to national markets.